Eight more ancient wrecks found at Fourni, bringing total in what should have been safe harbor in the Mediterranean Sea to 53 ancient sunken ships. 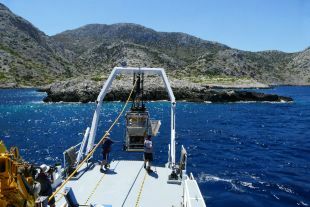 Another eight ancient shipwrecks have been found at the Fourni archipelago off Greece, bringing the number of ruined ships found there to 53. 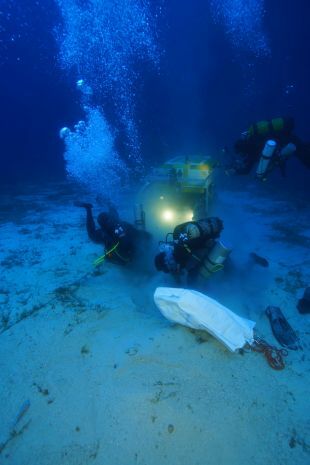 The discovery begs explanation, given that the sunken wrecks were found in just 17 square miles, and that Fourni was never home to any large settlement. 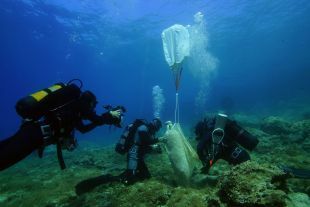 Yet the marine archaeologists have found the largest cluster of sunken ships known in the Mediterranean. Fourni (or Fournoi Korseon) is a complex of 13 small Greek islands and islets between Ikaria and Samos. One explanation could lie in the weather. 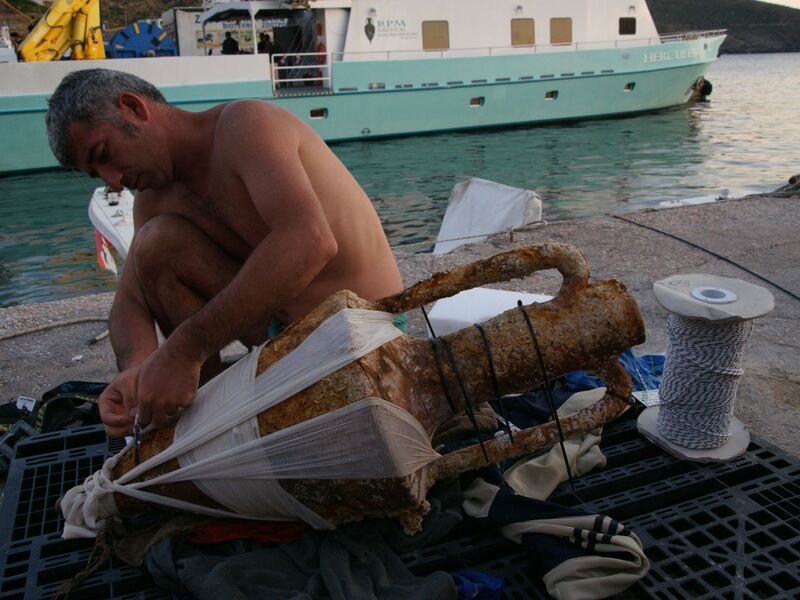 “The area around Fourni, Ikaria and Samos, is the most dangerous part of the Aegean Sea," says Peter Campbell, co-director of the project from the RPM Nautical Foundation. Storms there can turn violent and lacking other natural harbors, Fourni was the only place sailors could find safe anchorage, he says. Relatively safe, perhaps. Presumably the captains would anchor their ships in spots sheltered from blasts from the northwest winds. But come a rare southern gust, which happens, ships would be caught off guard and crash against the rocks. Or there could be another explanation. Given that there were large settlements on the nearby islands, a glance at the map shows that ships would have had to pass by the main island of Fourni. “This resulted in a high volume of traffic Fourni was infamous for piracy from ancient times through to the 19th century,” Campbell told Haaretz. Joseph Georgirenes, the bishop of Samos and Ikaria, described Fourni in 1678, writing, “Three Miles distant from the Island [Ikaria], on the South-side towards Patmos, lye some small Islands uninhabited; but know by the name of Furny, and furnish’d with good Harbours, capacious enough for all sorts of vessels. Here the Corsairs of Malta, and other Christians, us’d to lay in wait for Ships that trade from Scio [Chios] to Rhodes.” By "corsairs of Malta," Georgirenes was referring to pirate ships. “The last pirate, named Mitikas, was executed on Fourni in the 1860s. His great-grandson is a free diver on the island who is a key member of the project for locating shipwrecks,” Campbell added. To be fair, pirates are often indistinguishable from regular mariners in the historical record. Sometimes the nature of the beast is a question of who wrote the history. The dates of the shipwrecks range from the late Greek Archaic period (around 2500 years ago) to the Early Modern period (1750-1850 C.E.). 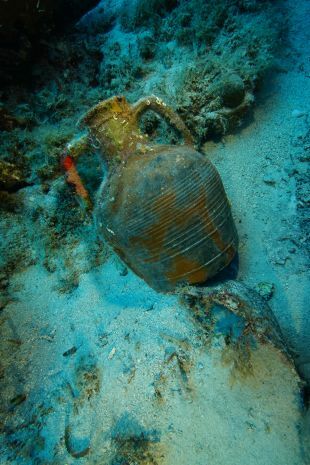 Nearly all the old ships the diving archaeologists found at Fourni were carrying amphorae, large pottery jugs that were the delivery containers of the ancient world. “They are big piles of hundreds of broken amphorae," Campbell told Haaretz. 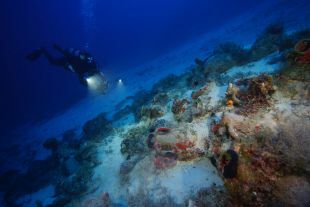 They also fonud an Ottoman-era wreck that had been bearing tiles, and which left stacks of tiles on the seafloor. 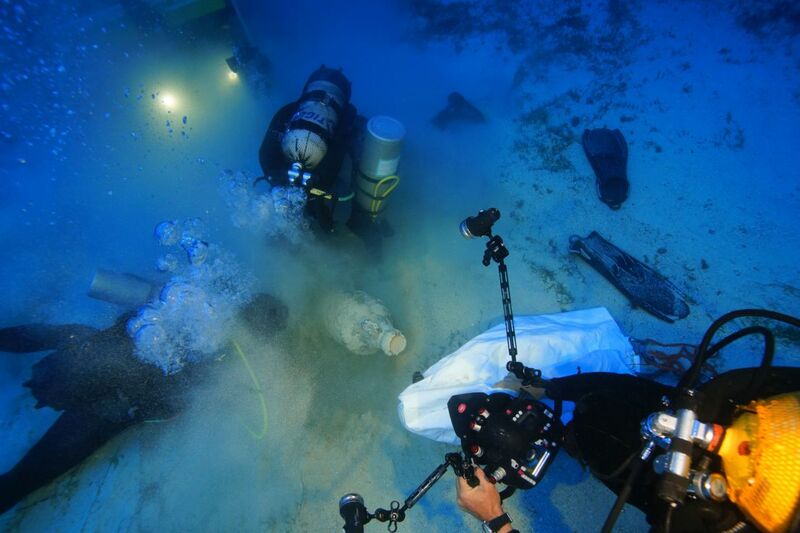 The divers also found gear belonging to the mariners, including cooking pots and lamps, as well as anchors dating from the Archaic Period through the Byzantine Period, composed of stone, lead, and iron. while timbers remain from the two modern wooden wrecks from the 18th or 19th century, any organic remains from the older vessels are long gone. However, their cargo indicates they were merchant ships, Campbell says. Of the 53 ships, six clearly were from the classical period (510-323 B.C.E) and bear cargo of Aegean origin, he adds. One bore a set of amphorae from the Greek island of Chios dating back to the classical period. Later ships bore cargoes from the Black Sea, for instance. Ironically, the one ship on record as sinking in Fourni hasn't been found. “There is a historical account of a 17th century French shipwreck in one of the bay, which we hope to find in future years," says Campbell. Also, a British aircraft crashed in the sea near Fourni during World War II. They haven't found that either. 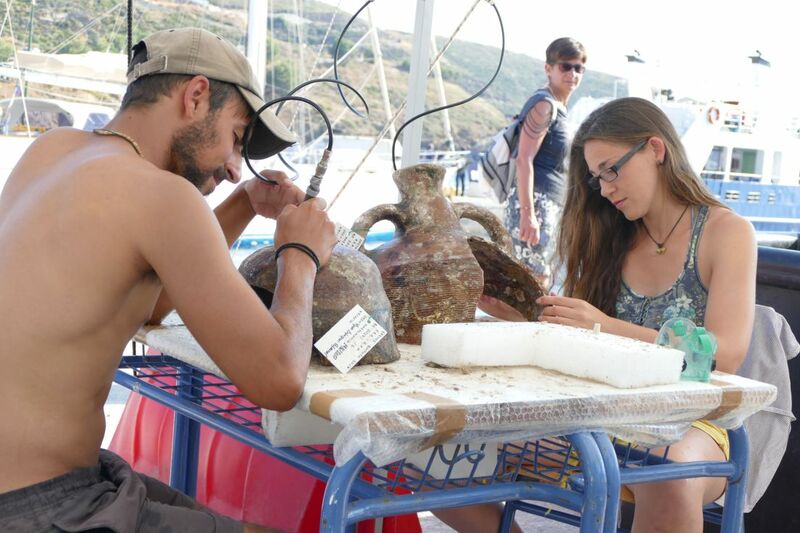 The primary focus of the archaeologists in the present season, and in the fourth season to come, is more survey and documentation than fresh exploration. 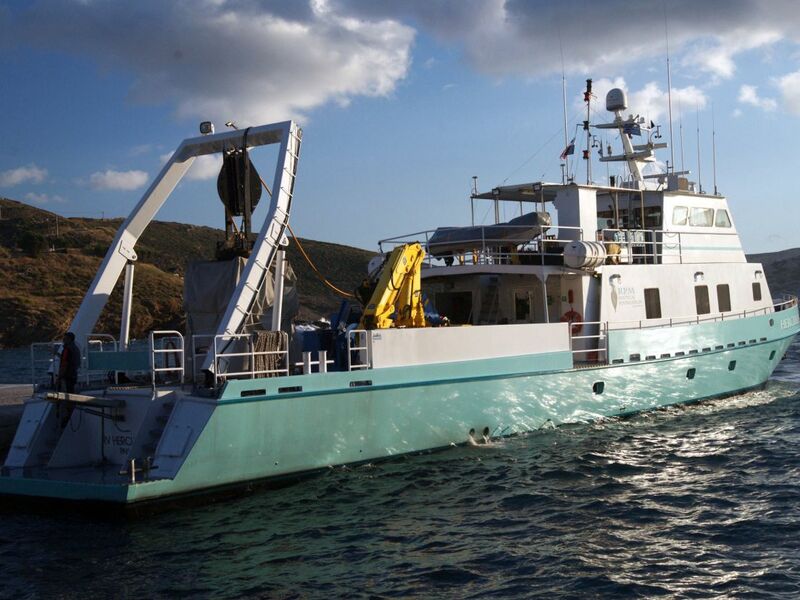 But just as sinking by Fourni had evidently been – with all due respect to vicious pirates – a matter of weather and serendipity, so may the discovery of more ancient wrecks in the depths.